How many times have you struggled logging in on a newly downloaded app? How many times have you registered on a social network, a streaming service or a productivity tool and you found out, that they also provide a mobile solution? Well personally, I can recall a lot of times, that I found myself in that position. A lot of apps provide great UI, even on their log-in screens, but UX is something more painful and as a result something more valuable, when you are trying to attract new users! Although one might think, this would be quite a hard to implement task, it is actually a lot simpler. 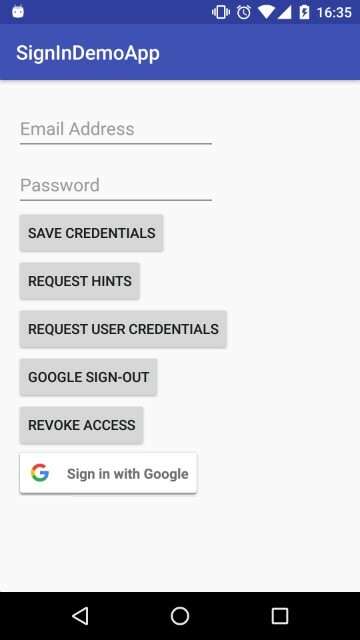 Google already provides us with two ways of improving the sign-in experience in our apps. The majority of users download an app and they want to quickly interact with it, especially if it is a productivity tool or some kind of a social network. What a better way of helping them by letting them sign-in in just one tap? Almost every Android user adds his/hers Google account during the setup process and most of the time it is their primary email address, which means the email that they most probably use when they sign-up on various services. But usually, people tend to add more emails and Google accounts on their phones, for example: their work email. from Play Services, which includes Google Sign-In API, as well as, the Credential API for SmartLock. For the needs of the article we have created a demo app which is available on Github as well. Google Sign-In, was previously known as Google+ Sign-In back in time, when Google required every new user to also create a Google+ social profile. After Google dropped that requirement, all of their services were rebranded to plain Google, like Google Sign-In, for example. As you can see at the bottom of the screenshot, this is the rebranded Google Sign-In button offered as a standalone view from Google. Now that we have added the Sign-In Button we need to configure it on our activity as well. addConnectionCallbacks → Makes the current Activity, aware of GoogleApiClient connection lifecycle. enableAutoManage → Let’s GoogleApiClient “hook” on the current Activity in order to manage the connect-disconnect operations based on the Activity’s lifecycle. addApi(Auth.GOOGLE_SIGN_IN_API, googleSignInOptions) → Here we are declaring that we will use the Google Sign-In API, with the GoogleSignOptions we have already created. addApi(Auth.CREDENTIALS_API) → We will also use the Credentials API for SmartLock, so we are declaring this one as well. 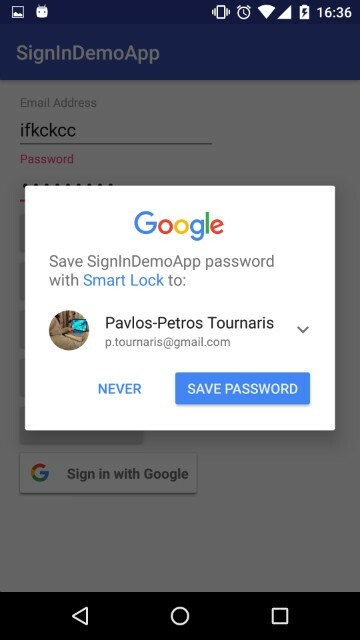 SmartLock is a powerful password manager that Google provides through the same Google Account Login package in Play Services. But what does SmartLock offer for us as developers and our end users? 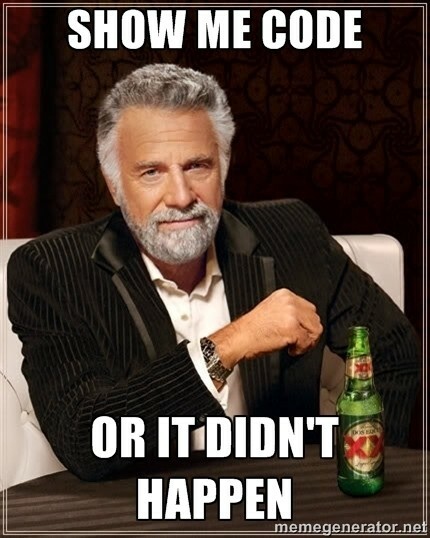 Ask users to save their credentials. Request those credentials when opening the app. Use credentials saved on Chrome, if we declare that our website and app can share credentials. 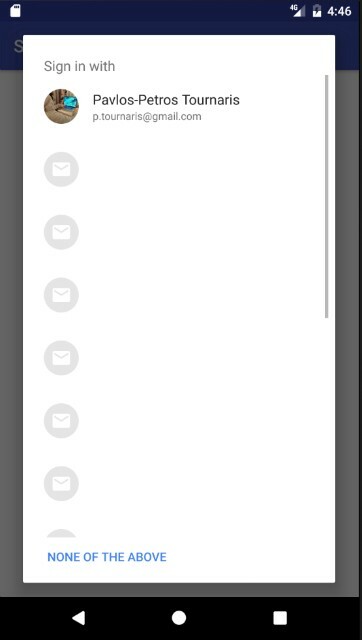 Display email hints in case we want to help the user in the sign-in/sign-up process. Finally and most importantly, all of the above are stored on Google’s servers and users have complete control over what is saved/deleted. We will cover all these cases in detail below, but if you think there might be something missing, please make sure to check the demo project on Github. First of all we check to make sure that the email address and the password, are valid for our business logic (this is a quick implementation for the purpose of the demo) and after that, we create the Credential object. Finally, we invoke the Credentials API in order to save the previously created Credential. Below, you can see how that is presented to a user. Credential is a key element of the SmartLock domain. It holds all the credential information (either account type or password, a name and a profile picture URI) related to an E-mail address. Credentials can either have an Account Type or a Password. After saving the aforementioned credentials, we can now request them when opening the app in order to automatically sign a user in, or give them the ability to use them for instant sign-in. In order to request Credentials, we need to create a CredentialRequest, that specifies what kind of Credentials we want to request. You can declare that the Credentials you want, should contain a password or their type is one of: Google, Facebook, Twitter etc. One thing, you should consider here, is that the Credential object retrieved does not have an “email” field. Actually the email on the Credential is named “id”. Another strange thing is also that if you have requested Credentials of specific Account types, you need to have in mind that they will not contain a password, due to the fact that Account type and password fields can not co-exist. On this link you can find detailed steps on how you can create the Digital Asset Links JSON file and add it on your app. The last step, in order to enable this integration, is to fill out an Affiliation Form, which usually takes 2 or 3 days to be accepted. At this point, we have to thank Steven Soneff (Steven Soneff) from Google’s Identity team, for his valuable help on this process. 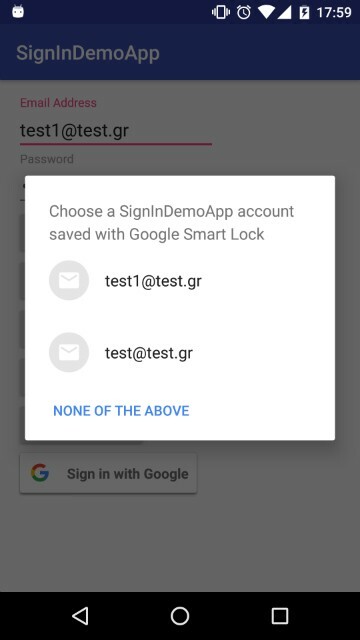 As a nice fallback when a user does not have any Credentials stored for our app, we can display some E-mail hints, in order to help the user choose an E-mail to sign-in or sign-up. Google Account Login APIs are quite identical which helps us easily bootstrap the requests. Let’s explain this code a little bit: We set the HintRequest to support email addresses and we also add a HintPicker configuration, which allows us to show a cancel button and also have a prompt as the dialog’s title. In our case we chose to show a sign-in prompt. Google also provides a sign-up prompt. Google Sign-In and SmartLock possible outcomes can produce a lot of boilerplate code, as well. You can find AuthManager on Github.